We are pleased to introduce the new SR340 coffee Roaster. This new model has all of the same features and capacity as the SR300, but it has the added feature of fan speed control. The fan control resolves the biggest issue with the SR300, which is the inability to move heavy beans early in the roasting process, resulting in an uneven roast unless attended. This new models variable fan speed control allows for an even roast without your intervention. Similar to the SR500, only without the temperature select switch. We highly recommend this new roaster due to it's economical price point and ability to provide an even roast. 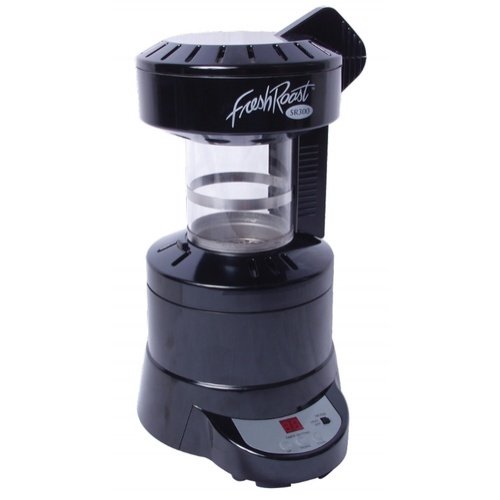 Perfect for the new coffee roaster or for the roasting enthusiast, this quiet and efficient model is sure to please! There are a couple of improvements from the original Fresh Roast Machine – the biggest two improvements are larger quantities roasted, and better roasting controls. The machine can handle 3.5-4.5oz of coffee, depending on the bean. (The quantity is just about perfect for a strong 12 cup French Press) In addition, there are heating, cooling, and time added/subtracted buttons. The roaster is still as fast as ever, taking about 6 minutes to roast a batch, with about 3 minutes of cooling tacked onto that. It’s also one of the quietest machines around – appropriate for inside use! The cracks are extremely easy to hear, making the machine ideal for those starting out roasting. 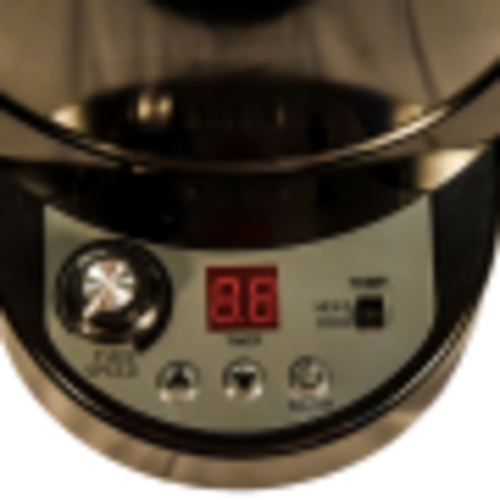 Please note: overall roasting time may vary depending on your household outlet's voltage rating, as well as the overall size, density and moisture content of the beans. This is a gift; I have one and like it. This was my second Fresh Roast machine, the first unit lasted for close to 10 years. This one started under roasting a few months ago and now does not get hot enough to roast beans. (16 months) The roast chamber is a really bad design, there are dead spots in the corners of the bottom that trap beans that then get burnt. It takes a lot of attention to get a decent roast. The fan adjustment adds cost and little value. The timer buttons up/down are maddening to work, The old machine with with a simple mechanical dial timer and no fan adjustment and plenty of heat was sooo much easier to use and lasted. Keep fan at high. If not, you will have to pick out several burnt beans that stay at the bottom. 2/3 cup green beans at high fan for 4.0 minutes is the end of 1st crack. 1st crack starts at around 3 minutes. Kind of noisy at high fan. Not too smoky unless you want French roast. I'm a rookie at roasting coffee, but have had amazing results, with some trial and error. Folks are loving what I'm roasting, grinding and brewing.